The Catholic heritage in Croatia is never more apparent than during the celebration of Christmas, which, like the United States, falls on December 25. If you are in Croatia's capital city, pay a visit to the Zagreb Christmas market in the main square. The Dubrovnik Christmas market is another must-see in that Croatian top destination. Christmas Eve, called Badnjak in Croatian, is celebrated in a similar manner to other countries of Eastern Europe. Straw may be placed underneath the Christmas Eve tablecloth. Fish, as a substitute for meat, is served, though a meat dish is usually presented as the entree on Christmas Day. Other dishes include stuffed cabbage, poppyseed rolls, and a cake made from figs. A yule log may be burned after being sprinkled with holy water or spirits, and its fire is tended throughout the night so that the flame does not extinguish from neglect. On Christmas Eve, the Christmas wheat, which has been sprouting since St. Lucy's Day on December 13, is tied with ribbon in the colors of the Croatian flag—red, white, and blue. Sometimes a candle in combination with other symbolic items is placed within the wheat. The wheat may then be placed under the Christmas tree, and its height, density, and overall lushness coincide with how much luck the grower can expect in the coming months. The wheat symbolizes the new bread of the sacrament of the Eucharist. Christmas Day is spent with family or at church. 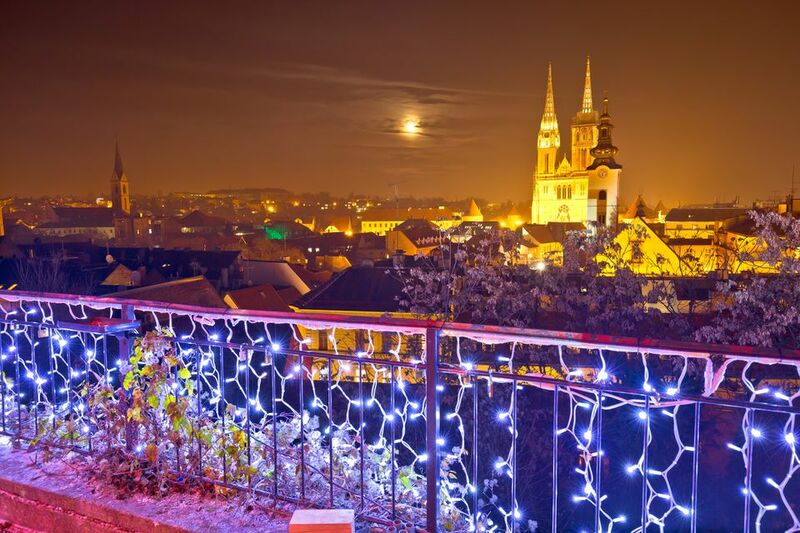 Say "Sretan Bozic" in Croatian if you want to wish others a "Merry Christmas." The Christmas season comes to a close with the Feast of the Epiphany on January 6. Some Croatians open gifts on Christmas Day, but Croatia also recognizes ​St. Nicholas Day on December 6. Gifts are sometimes given on St. Lucy's Day, as well. The Croatian Santa Claus is sometimes called Djed Mraz, which is the Croatian counterpart to Russia's ​Ded Moroz. Djed Božićnjak, who is the equivalent of Grandfather Christmas, or baby Jesus may also be credited with gift-giving to the children during the holidays. Instead of hanging a stocking, Croatian children may put their shoes on the windowsill to be filled with treats. Besides wheat sprouts, Croatians decorate with wreaths and trees. Licitar hearts—or hand-decorated cookies—often decorate Christmas trees in Croatia. Licitars are made of sweet honey dough. They are a traditional symbol of Zagreb and are used as an ornamental gift. Christmas creches, or nativity scenes, are also used for decoration in Croatia. Various greenery, including evergreen boughs, is a typical Christmas decoration. Straw, brought into the house partly as a reminder of the original Christmas manger, is associated with superstition. If a man sits on the straw first, the farm animals will produce female offspring, but if a woman sits on it first, the opposite will happen, according to the tradition. If you are shopping for Christmas gifts in Croatia, consider local products such as olive oil or wine. Other gifts from Croatia include jewelry, embroidery, and licitar hearts that are sold by vendors offering traditional goods.